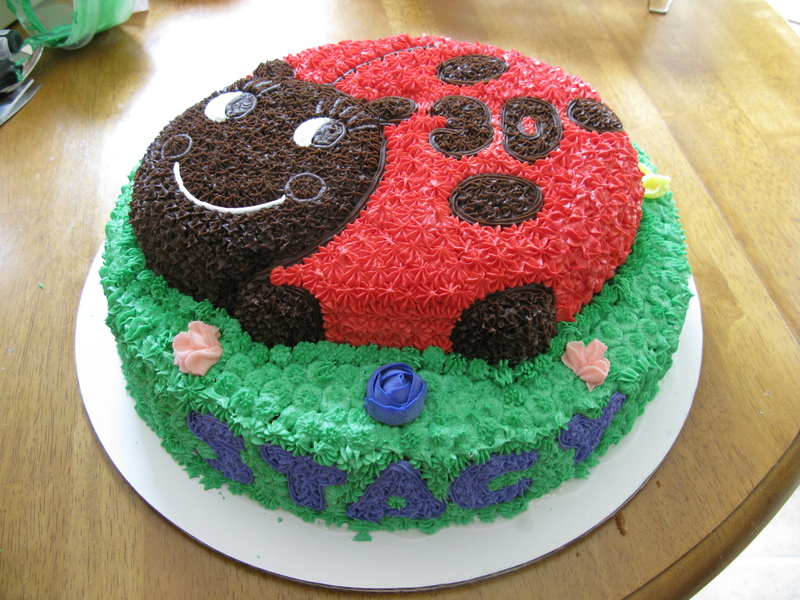 A friend turned 30 this year, and she absolutely loves ladybugs. I wanted to do more than just a ladybug, so decided to do another cake underneath, making this a 2-tiered cake. The ladybug is chocolate cake, the brown is made out of store bought chocolate decorator icing, and homemade decorator icing tinted red. The bottom cake is 2 layer 14 inch round yellow cake with decorator icing tinted green. This cake was heavier than I anticipated, but very grateful I put 2 cake boards together for added support. What I learned: Not to use the chocolate decorator icing for making stars, use regular chocolate icing instead. It was very difficult because the icing was not soft, my hand ached, and it took forever to get all of the chocolate icing done. When placing the dowel rods to measure out, I’ll definitely put it down in the cake and mark where it needs to be cut, because two of the rods were sticking up higher than they should have, and I had to pipe extra icing to cover it up. I ordered the ladybug cake pan and 14 inch round cake pan from amazon. The green and red icing is buttercream, the dark is chocolate.